ProTeam will help maintain your pool for the entire season. Pool water should be checked regularly to maintain the proper PH & Chlorine levels. 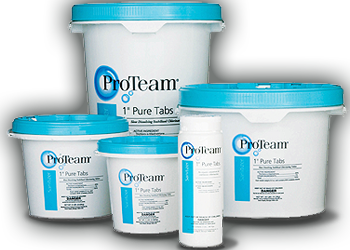 Total alkalinity & calcium hardness are also important in keeping a healthy pool. Clearwater offers free water testing to all of our customers. ProTeam is a simple, easy way to keep your pool looking great all season long. With ProTeam weekly maintenance becomes simple. It's easier to use than other maintenance programs & everything you need comes in 1 simple box. Ask Clearwater about the ProTeam for your pool today. Click HERE and visit the ProTeam webpage for more information.